Our sister store, Fashionably Yours, is a Bridal Boutique that stocks a large range of wedding gowns, bridesmaid dresses, flower girl dresses, formal dresses, debutante gowns and many other dresses and accessories. Fashionably yours sells both online and in-store. 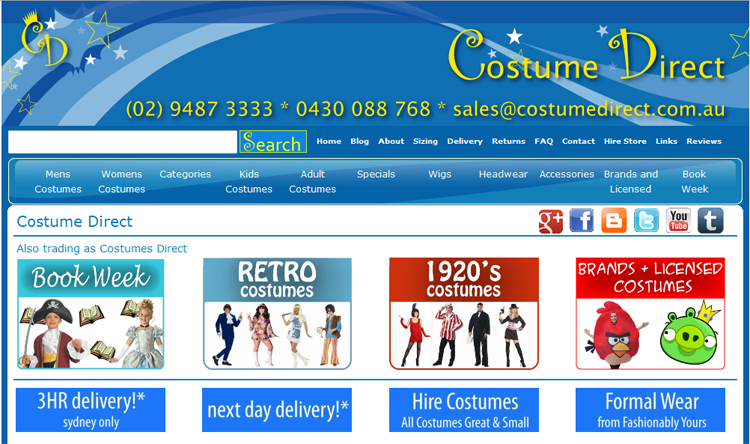 Want a range of fancy dress and accessories to purchase with speedy delivery Australia wide, competitive prices, and great customer service? Then you’ve come to the right place. We sell costumes and accessories (including capes, gloves, glasses, jewellery, bling, beards & moustaches, masks, legwear, shoes, wigs, weapons and wings).From the ancient Egyptians, 1920’s (Flappers and Gangsters), 50’s (Rock’n’Roll), 60’s & 70’s (Go Go Girls, Hippies, Disco Kings and Queens), and 80’s, there’s no time like the present to party.Superhero or villain, pirate or wench, Star Wars or Sailors, Bollywood or Beetles, Mickey, Minnie or Mascots, we provide a range of quality costumes and accessories. We post Australia-wide for $10.95. Submit your order by 2pm (Sydney time) and your order will be dispatched with Express Post on the SAME DAY (Weekdays only)!